As we count down to 2013, it is also time to look back and sum up the past year. I will say it was a good year for our family because we celebrated our grandmother’s 100th birthday in May as well as our mum and dad’s birthdays with a Thanksgiving. As mum turned 80 in September and dad marked his 90th birthday in October, my siblings and I brought family and friends together for a Thanksgiving in October. While the celebrations were special and memorable, an extension to our Thanksgiving – a road trip with mum and dad – was a particularly significant event for me in 2012. As we were compiling RSVP responses to invitations for the Thanksgiving celebration for our parent’s birthdays, we learnt that the Voon family in Petaling Jaya was not able to come. 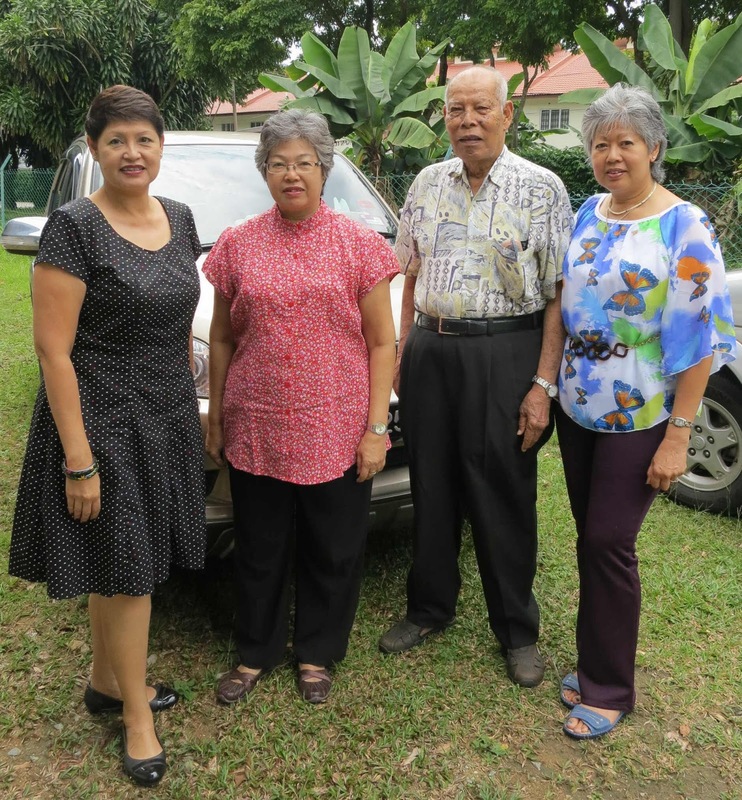 Aunty Betty was unwell and her children, Eric, Lawrence, Violet and Esther Voon, were taking turns to care of her. Aunty Betty is like a sister to dad when they grew up together in Ipoh and due to failing health they have not met for the longest time. My eldest sister Ruby and I hoped to visit her with dad – if we could persuade him – because in his advanced age, we know he is now reluctant to travel. 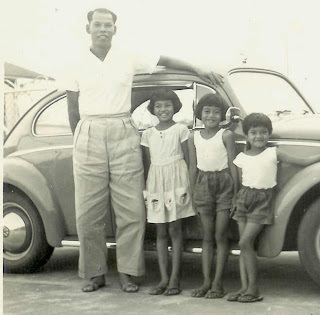 Dad is the inspiration for our travels because when we were kids, almost every year he would drive us to Ipoh, Kuala Lumpur and Cameron Highlands for family holidays. I was probably too young to know but I’m told that we used to start from Johor Baru in the wee hours of the morning when it was still dark and travel the long and winding old trunk roads, with several stops in between to rest both car and driver, and finally reach Ipoh at night. cousin Bernie and eldest sister, Ruby! We have a large collection of holiday photos taken at places of interest and besides having fun, I remember often being very carsick but dad had a plastic pail in the car, ready for me to throw up if I felt too nauseous! So we started making travel arrangements and that all-important appointment to meet with Aunty Betty. The next morning, at the breakfast table, dad brought up the subject of our impending trip to KL and I privately wondered if he was having second thoughts about going. He asked me when we were coming back – and I thought it was a valid question since he is quite the homebody who could not stay away for long. I told him we will just do an overnighter but instead of being in a hurry to come home, he suggested that we go on to Ipoh! I almost fell off my chair in shock but kept my cool and quickly agreed to his suggestion. It’s not everyday that dad asked to see the place where he grew up and I was determined to take him there. For me, it was not just a trip down the proverbial Memory Lane but it was the first time in umpteen years since dad was going on a trip with his three daughters! While most people may know mum’s family by reputation, very few know the details of dad’s origins. 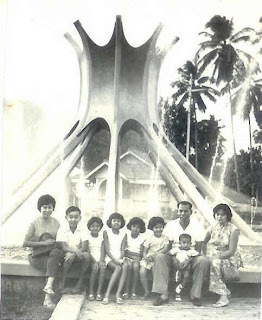 I remember visiting Ipoh during school holidays and staying with Uncle Thin Fook, Auntie Annie and cousins, Bernie and Esther. In alternate years, they would come to JB and I remember going with them to places of interest in Singapore like Haw Par Villa. If they did not visit, at year end we would receive by parcel post, a gift pack filled with Ipoh snacks that always included the famous Menglembu [still in their pods] peanuts! 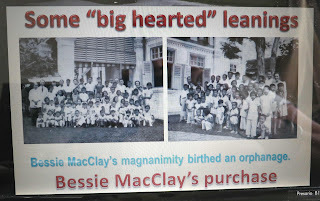 It was much later that I realised that dad does not have any family because he was brought up by God’s grace under the care of missionaries, George and Elizabeth Wilson in the Elim Gospel Hall orphanage. I finally figured out that the only family dad knows are the people he grew up with in the Elim home and Uncle Thin Fook in Ipoh was like a brother to him. 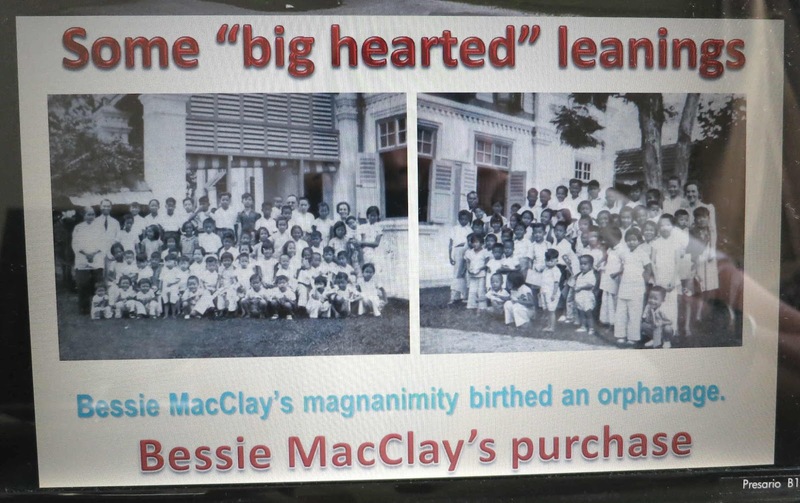 Historical records show that the orphanage started with a girls’ home through the goodwill of Bessie MacClay and the boy’s home was for orphans and borders that came from destitute families in and around Ipoh. Many years ago, when I read Roots a book by Alex Hayley [also made into a TV mini-series] that traced his ancestors to the native boy who was captured and sold as a slave in the US, I was curious about my own roots and started to quiz dad. 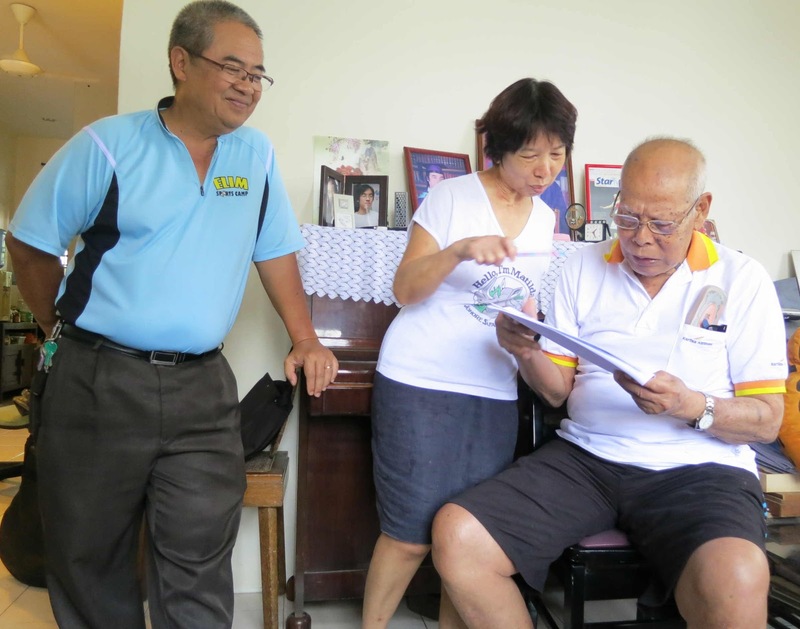 He was too young to recollect much except what we know from his birth certificate but he remembered that he was probably aged 3 when his father brought him to Sarah Shirtliff in Selangor and she later sent him to the Wilsons in Ipoh. 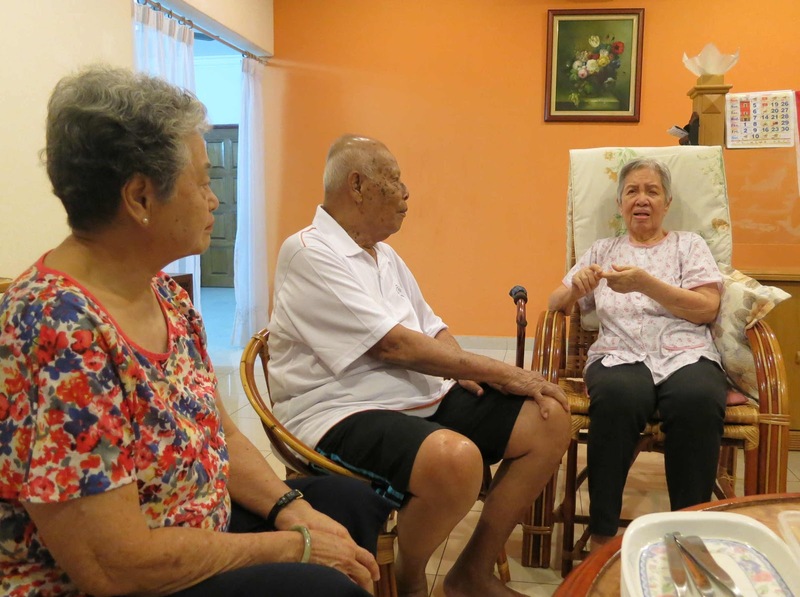 Now at age 90, dad is one of the last surviving “boys” who grew up in the Elim home and it was very special for him to meet Aunty Betty – one of the “girls” from the girls’ home – to reminisce about bygone days. Every year, we send each other Christmas cards but with Aunty’s failing eyesight, it is now a challenge for her to write to us or read our messages. 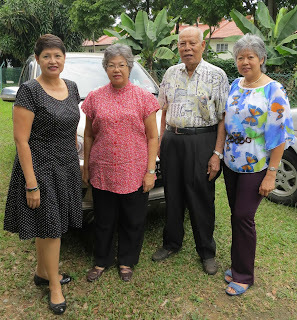 So it was particularly meaningful for dad and Aunty to meet each other, while at least one of them could still travel. I will fondly remember her account of how the “boys” set Uncle Victor Voon up to meet (and date!) Aunty Betty – when he wanted to buy a bicycle and she was working with Whiteaways, the department store that sold bicycles among a host of imported items! 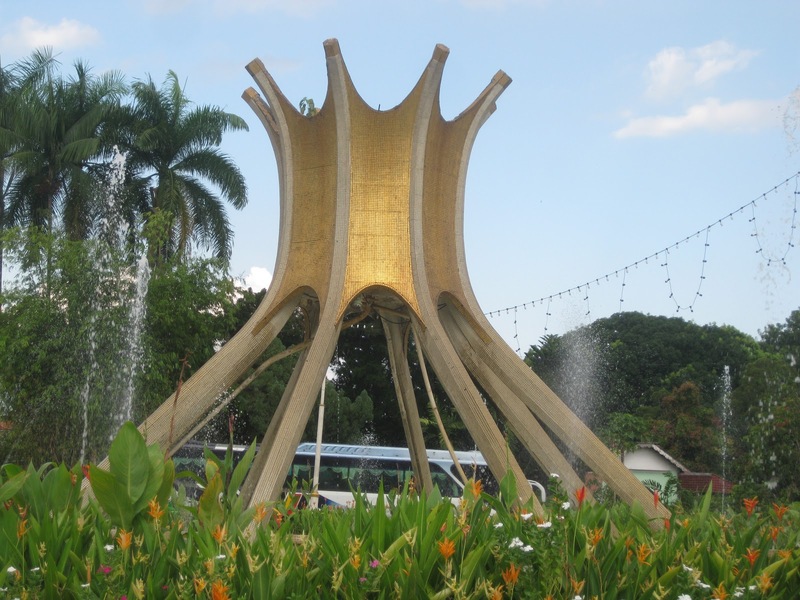 Ipoh's landmark Sultan Yussuf Fountain looks smaller now! It was a precious, nostalgic trip to take dad to meet Aunty and the next day, to visit Elim, the place where they grew up in Ipoh. It was my privilege to drive and point out sights to dad and hear him tell us how it used to be back in those days. Throughout the journey, our conversation was liberally punctuated by the phrase “last time” or “in the olden days” because dad could not help comparing how different things are now from what he was familiar with. With new buildings and one-way streets, very little of the Ipoh in dad’s growing-up days remains today. 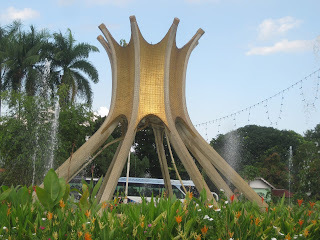 There are drastic changes to the city skyline but the landmark Sultan Yussuf Fountain at the junction of Hugh Low Street, Gopeng Road, Tambun Road and Brewster Road, welcomed us into the heart of Ipoh. Even though it looks much smaller now and the fountain jets are reduced to feeble spurts, it is a fond and familiar sight as we passed it to find our way to Jalan Chung Thye Phin where Elim Gospel Hall stands in its original site, within a complex of modern buildings. After closely scrutinizing the photos, dad could recognize several girls – his older “sisters” – but he could not identify himself as a child. After all, he was then just a kid. precious old photos of Elim's residents! Jimmy told us that Elim Gospel Hall has plans to celebrate their 100th anniversary in 2013 and invited dad to come for the celebration. As we anticipate the coming date, I have been given an assignment to produce a video clip of dad speaking about his memories of Elim to be used at the anniversary celebration. The Elim Gospel Hall Centenary Celebration in Sept/Oct 2013 is certainly another nostalgic, significant and special event to look forward to and God-willing, dad may be ready to travel again then! 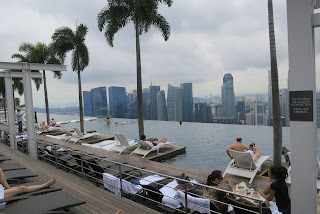 While visiting relatives in Singapore recently, an aunt suggested a trip to Marina Bay Sands for an experience at their SkyPark. 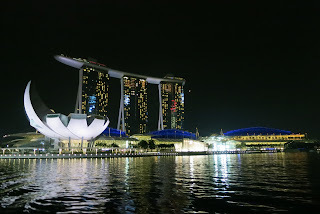 Her vivid description of the Sands SkyPark that crowns the trio of towers in one of Singapore’s most recognizable landmarks assured me that it is a must-see destination. 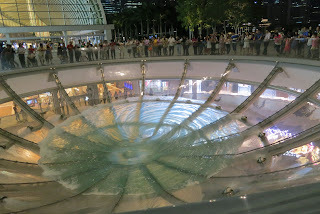 So it was like a dream come true a few weeks later, when I was a guest at the Marina Bay Sands and discovered ten things to experience and enjoy here! This view encapsulates Marina Bay Sands Singapore as an integrated resort with the hotel housed in the trio of towers, crowned by the SkyPark above with the Shoppes in the mall below, an adjacent Expo & Convention Centre with an outdoor Event Plaza between two Crystal Pavilions. In the foreground stands the imposing ArtScience Museum with its unique Lotus-inspired design and the MasterCard Theatres located just behind it. By the time my boat returned from the river cruise, I easily recognised the sites outlined against the clear night sky. 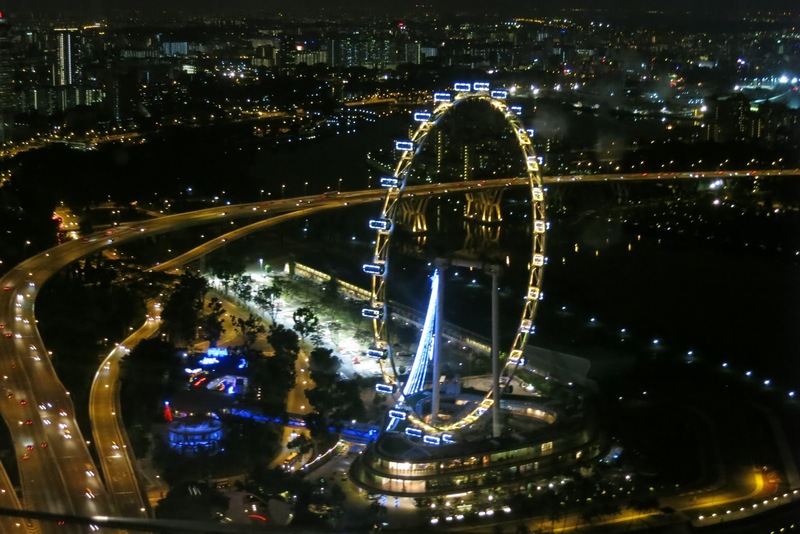 One of the city’s coveted experiences is a stroll on the Observation Deck armed with a camera to capture spectacular and panoramic views of the Singapore skyline. Spanning the length of four and a half A380 Jumbo Jets, with an impressive 12,400 sq mtrs of floor space, this is one of the world’s largest gravity-defying cantilevers. 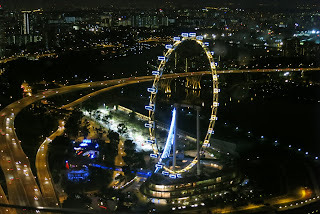 Visitors have ticketed access here but as a hotel guest, I took every advantage to visit the SkyPark on the level 57 as often as I wish to experience the breathtaking views by day and by night! Swimming 200 meters in the air to a stunning backdrop of Singapore’s skyline is an irresistible experience so I went for a dip in the SkyPark Pool, the world’s largest and highest outdoor infinity pool. The 150-meter long pool has a section for the kids and guests who prefer more privacy can opt for soaking in several Jacuzzis situated in the landscaped garden. The exclusivity of the SkyPark Pool area is maintained for hotel guests with access available to guided tours only. 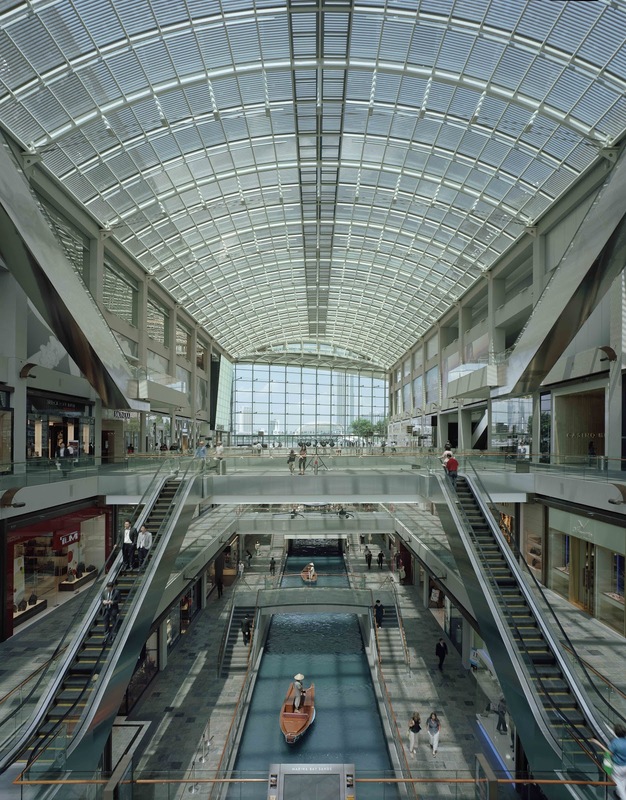 A short walk through an underpass took me directly to The Shoppes, the adjacent mall that felt airy and spacious probably because of the natural light pouring into the wide corridors. 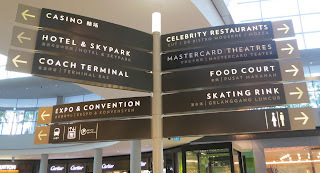 This creates a unique and comfortable environment to browse in a range of designer boutiques and dine in celebrity chef restaurants. 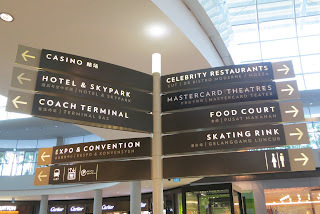 I can easily get lost in the maze of corridors but with the help of signposts strategically positioned in the sprawling mall, I found my way around and back into the hotel lobby quite conveniently. An impressive collection of large-scale sculptures and installations contributed by seven internationally renowned artists is woven into the architecture of the integrated resort and I explored the Art Path to discover some interesting creations. I found a crowd gathered around the outdoor rim of the Rain Oculus, a 22-meter diameter acrylic bowl set on a 90-ton steel and acrylic structure to watch the mesmerising, swirling vortex of water. 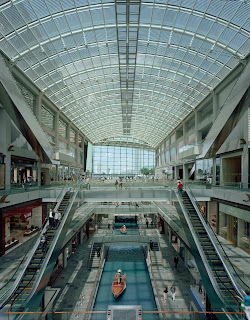 This 2009 creation by Ned Kahn allows water to run through a hole in the base of the bowl to fall two stories below! The Sampan Ride is a nostalgic treat for city-slickers to have a glimpse of this early form of transportation common in the Singapore of a bygone era. 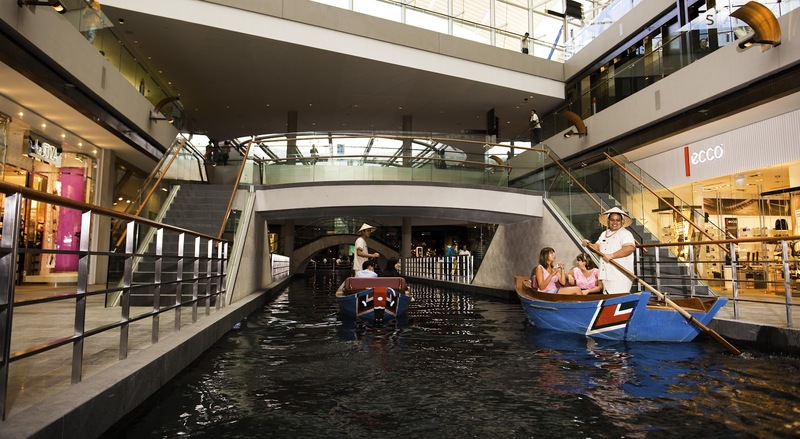 Embarking from the Canal Level in the mall, passengers enjoy a wooden boat-ride experience on the canal and around the cascading waters from the Rain Oculus. And as the boat circles the Rain Oculus passengers are encouraged to make a wish! The ArtScience Museum is a premier museum destination in Singapore for major international travelling exhibitions and current shows include “Outside In,” a photo showcase by three renowned photographers – Stuart Franklin, Mark Power and Jacob Aue Sobol – and “Fujians: The Blue Ocean Legacy,” the official exhibition of the 7th World Fujian Convention. 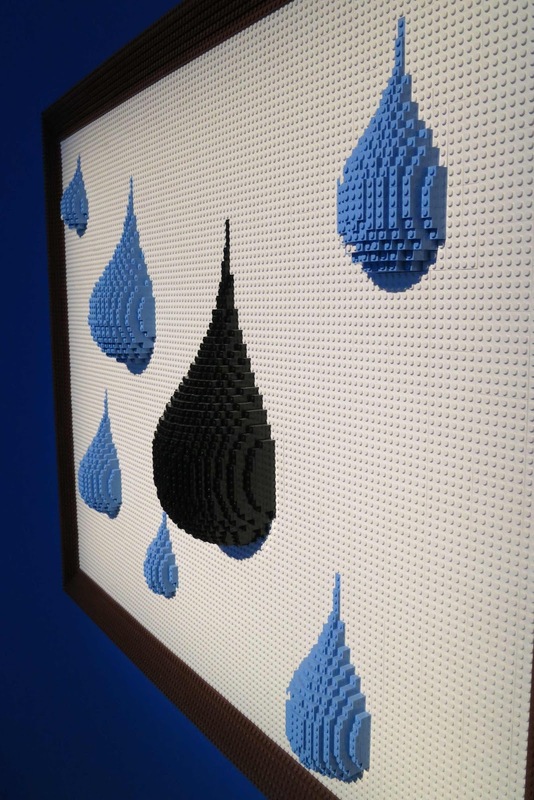 “The Art of the Brick,” featuring the largest collection of masterpieces created by Nathan Sawaya from Lego bricks, is a must-see exhibition for Lego enthusiasts of all ages. Renamed the “MasterCard Theatres at Marina Bay Sands” on Nov 19, the theatres continue to play host to the world’s best entertainment and offer MasterCard holders an exciting range of Priceless privileges like opening night shows, meeting the artistes, seat upgrades and discounted rates for the best shows here. Through partnering with Base Entertainment, MasterCard is able to provide cardholders greater access to world-class entertainment. I was thrilled to meet the cast and enjoy the Gala Nite show of the multi award-winning Jersey Boys – the story of Frankie Valli and The Four Seasons at its Singapore premier for a 14-week season. the pilot even welcomes you to take over the wheel! Take a ride on the updated version of the traditional bumboat in a 40-minute river cruise from the jetty next to ArtScience Museum. 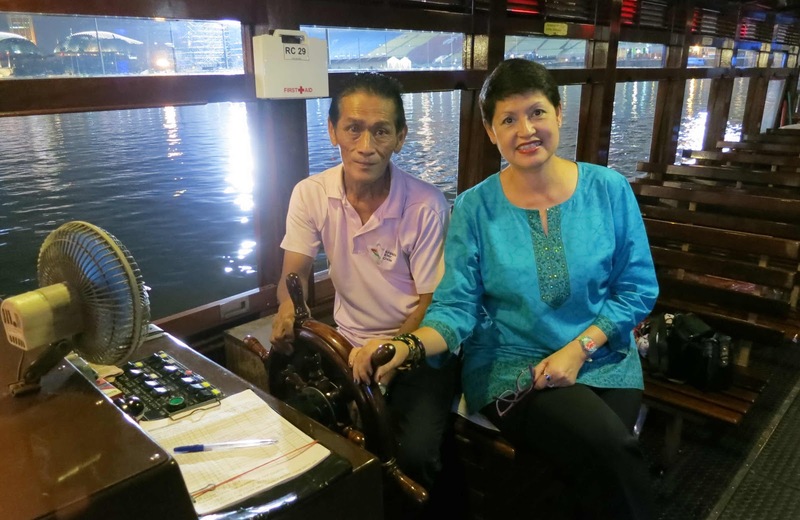 Bumboats have plied the Singapore River for more than a century and it is a nostalgic cruise that glides smoothly under bridges, passing chic cafes and boutiques housed in old go-downs, landmarks like the Merlion and the Fullerton to Clarke Quay and back. On the return, the pilot invited passengers to take over the wheel and I could not resist the opportunity to navigate the boat, just for a while! show set against the stunning Singapore skyline - FOC! Find a seat in the outdoor Event Plaza, located between the two Crystal Plazas to enjoy “Wonder Full,” a spectacular light and water show at two time slots every night. I caught the stunning show of visual effects created by the clever play of a variety of lights, video projectors and giant water screens at 9.30pm. 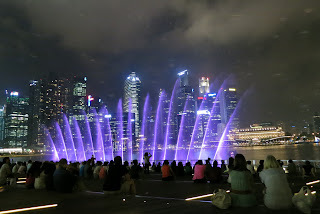 The Singapore skyline by night provided a magnificent backdrop and just as the audience was wowed by the wonderful show, clouds of tiny bubbles descended as a finale of the electrifying show! 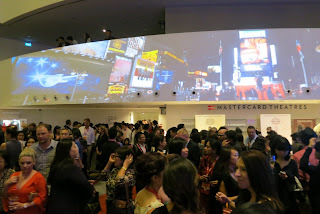 The writer’s experience with Marina Bay Sands Singapore was hosted by MasterCard Worldwide and Marina Bay Sands Singapore. Did you know that the putting down of unwanted pets is the number one killer of animals in Malaysia? Over the years, the shooting of stray dogs has cost the government thousands of Ringgit but it has not solved the problem. That is why Noah's Ark Animal Shelter or NANAS, strongly advocates mass sterilisation and proper legislation through micro-chipping as a more effective and humane solution. As long as cats and dogs are allowed to self-propagate or bred and later set free due to owner irresponsibility, there is no shelter with space large enough to house every stray cat or dog. Pet owners and animal lovers must be educated on this and be responsible to sterilise their pets to avoid another unwanted litter of kittens or puppies. With their responsible attitude and support, the number of strays can be successfully limited. 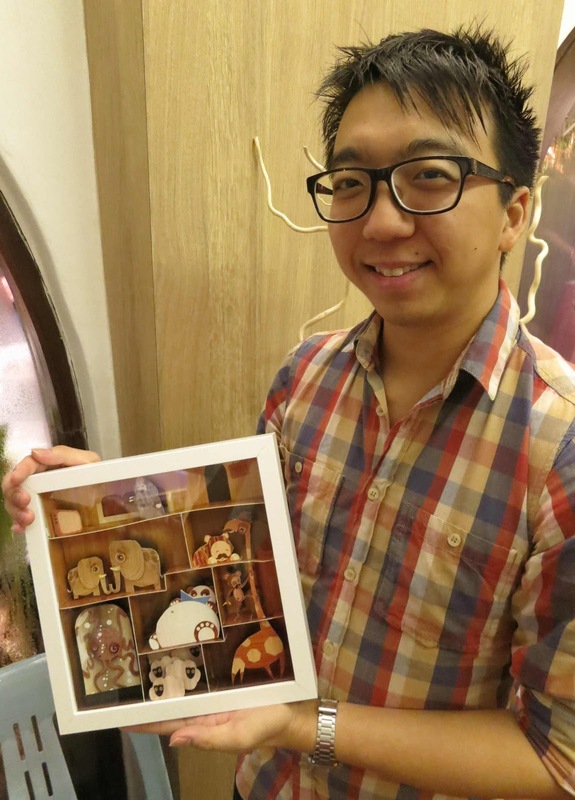 Jessica Chia, a graduate of Chapman Art School, who shares a commitment to NANAS’s aims, mooted the idea to hold an art fair, not only to raise funds to meet its operational costs but also to raise awareness of what NANAS is doing for animal pets in Johor. 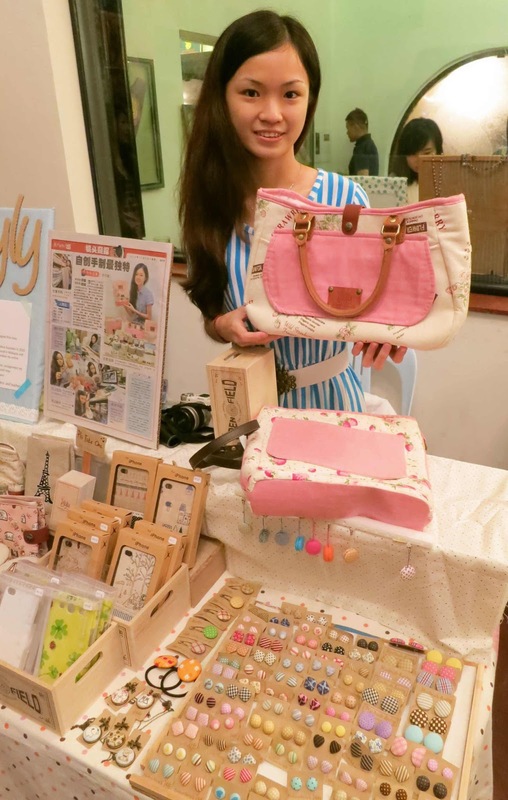 Working in partnership with EightLido as the venue sponsor, she organised a group of local artists and artisans to showcase their art and handicrafts with the proceeds from sales contributed to NANAS. 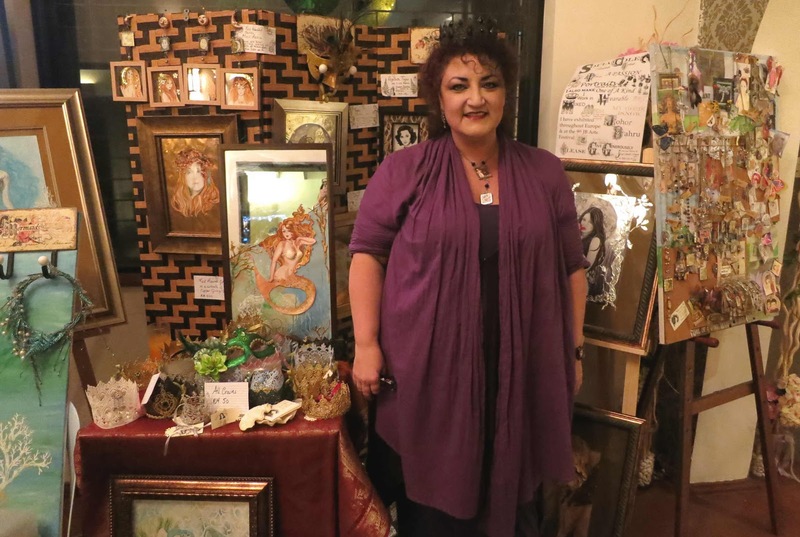 On Nov 28, art and animal lovers came together for the Art for Noah’s Ark event at EightLido, a chic restaurant lounge housed in a bungalow along Lido Beach. NANAS is a registered society that aims to reduce the number of strays on our streets through sterilisation. In the sprawling 10-acre shelter located in Pekan Nanas, rescued, unwanted animals are provided with their daily needs and a place to live and die with dignity. They have several projects like the Sterilise Our Street Cats and Dogs or SOS Cats and SOS Dogs projects in residential areas and Animal Birth Control (ABC) mobile clinics to remote villages but all these fully-subsidised projects need operational funds. “Noah's Ark is not a pet dumping ground,” said Raymund Wee, 62, president of NANAS, explaining that pets enjoy the attention given and want to be with people. His passion for the care and well-being of animals drove him to set up the animal shelter with clinics and projects to educate people in managing their pets and started Humane Education Clubs in schools. He believes that these are small steps in the right direction to help reduce the number of stray animals on our streets. ﻿“These artists have a passion and commitment for their art and handicrafts,” said Wee, impressed that the artists’ attitude is a reflection of his own passion for the care of animals. 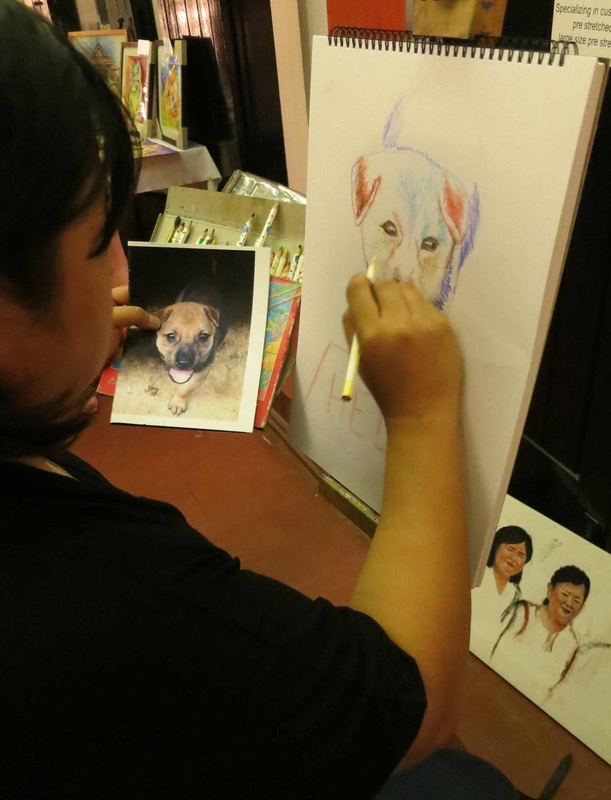 He appreciated the artists’ concern for animals and their generosity to contribute towards the fund-raiser for NANAS. “The art fair is an excellent platform to introduce the work of NANAS while shoppers admire and acquire pieces of unique art or handicraft,” he added. “This is the first time EightLido is hosting a fund-raising art fair that features local artists and live bands,” said Audrey Tan, EightLido’s events and media manager. 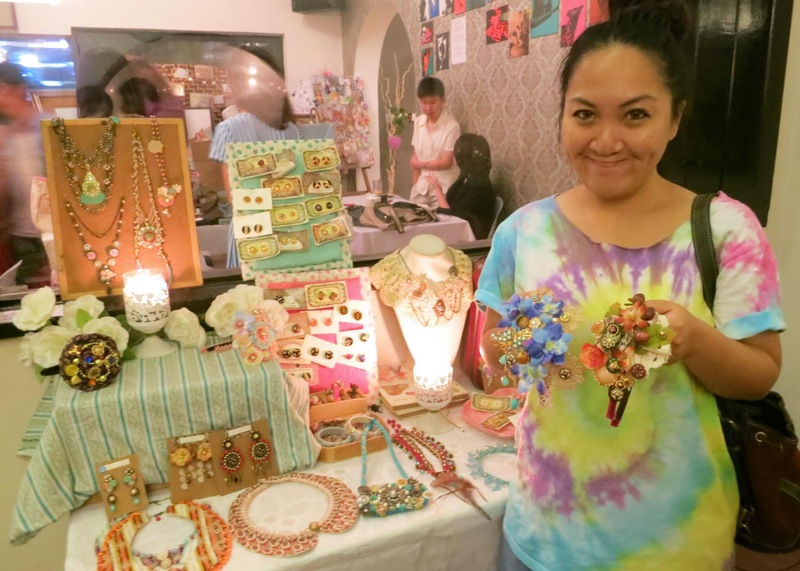 She was happy to see the convivial mood in EightLido as regulars and shoppers enjoyed a special shopping experience to the beat of cool music. The animal theme was enhanced by the presence of furry, four-legged friends that pet owners brought along to the event. 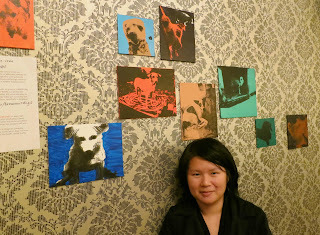 Jessica Chia better known as JC, presented “Tenacious D(ogs),” a collection of silk-screen portraits of cats and dogs created from photos taken of the residents of Noah's Ark, for sale. Ian Chua of Serendipity Studios created, “Noah’s Ark,” a unique 3-dimensional handicraft out of folded paper, especially for the event. 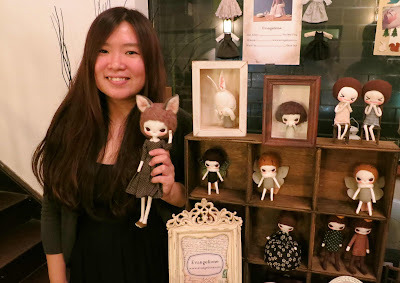 Chua, an animator by profession, enjoys a hobby in creating crafts out of paper and had a series of easy-to-fold paper animals for sale at this event. Jess Chia a hearing impaired artist from “Deafotology,” showcased her paintings of animals and sketches from photos of pets. 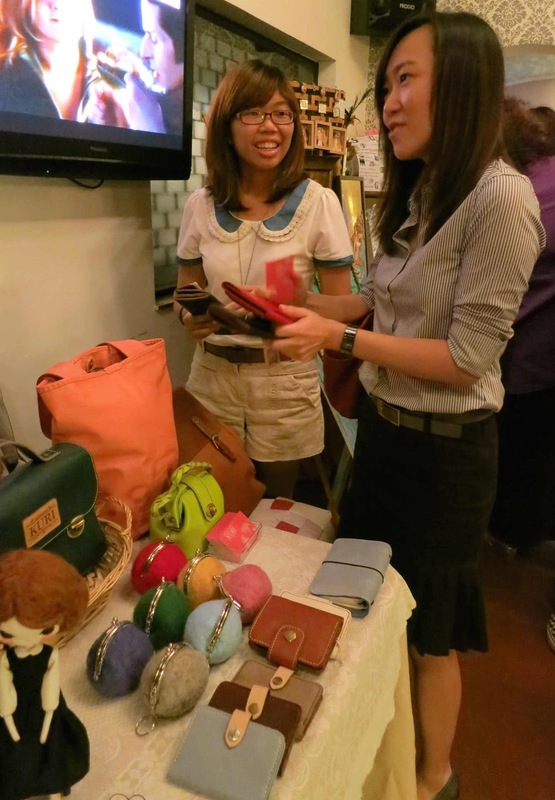 Interesting handicrafts for sale included “Art You Can Eat”, creatively shaped iced cookies by Faye Sing Hao Fei of Feimila, pretty handmade jewellery and fashion accessories by Isly Lee of “Islyly” as well as “Evangelione” collectible dolls by Yeo Mei Ying and “Kuri” hand-tooled leather purses and handbags by Nina Lai. 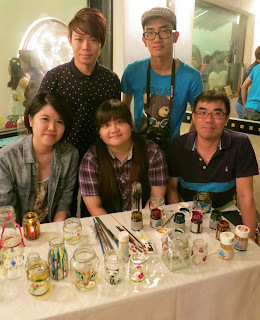 Exciting handicrafts for sale ranged from painted glass jars and limited edition cruet sets by a group of art teachers from Page One Academy to meticulously made 3-D art entitled, the “Princess Costume,” created from coloured rice grains by artist Clayrene Chan. Unique and intricate wearable art and fashion accessories for hair and outfits by artists, Ireen Tan Cheew Yee and Sofia Cole drew much attention as their creations are perfect for dressing-up party clothes. It was not long before many at EightLido were spotted wearing some of these artists’ creations – a truly encouraging sight as they were appreciating wearable art while contributing towards a worthy cause. 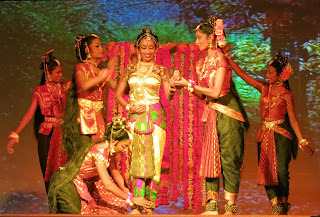 Lovenya Vigneswara Rao was just 4 years old when she first saw Ajith Bhaskaran Dass perform in an Indian classical dance production by Suvarna Fine Arts in the RTM auditorium. 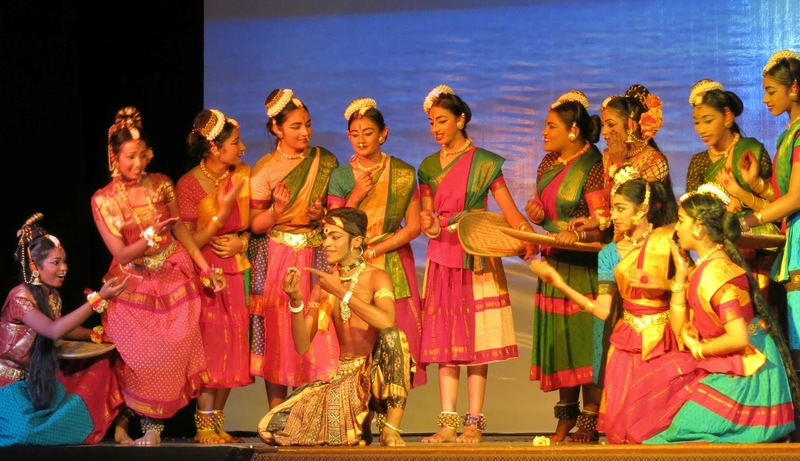 Ajith, renowned as one of the most accomplished Bharatha Natyam dancers in this region, has performed in some of the most prestigious venues around the world and established his own dance academy, Suvarna Fine Arts, 19 year ago. 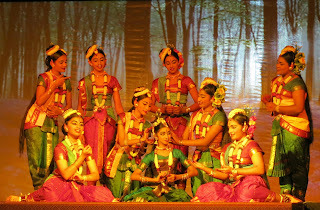 Captivated by his mastery of techniques in the rigorous disciplines of both Bharatha Natyam and Odissi, Lovenya persuaded her parents to register her as a student with Suvarna Fine Arts where Ajith is the Artistic Director. 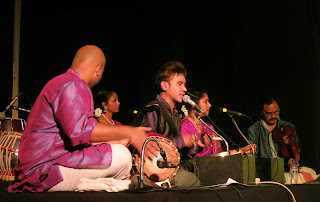 Johor-born Ajith left a career in law to focus on his passion for Indian classical dance and he was voted Best Male Dancer in the December season of the International Music and Dance Festival in Chennai, India by the Shankarabharanam Trust in 1996. This versatile performer and choreographer has won numerous accolades for his work and is proud to be the first male Indian classical dancer to be featured in the 2000 International Arts Festival in Frankfurt, Germany. He is also the first Malaysian to perform at the famed Lincoln Center and at the Joyce Theatre, Broadway, New York in 2003. Now aged 14, Lovenya and her sister, Kausalyaa, 12, are training under Ajith along with their friends Leeshalini Muralitharan, 13, and Ganggadevi Athi Naidu, 15. 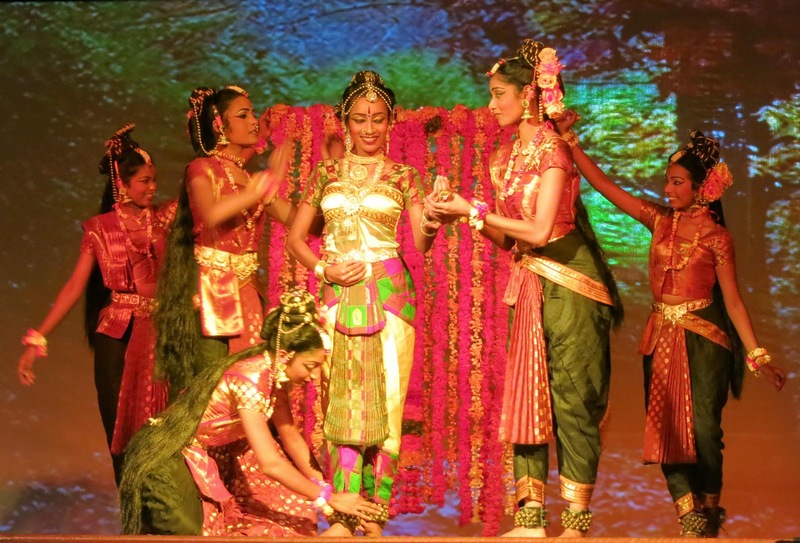 They attend regular dance classes on Sunday afternoons but for 6 months, a cast of 50 students practiced hard for their annual presentation, entitled Shakuntala, the Ring of Remembrance. 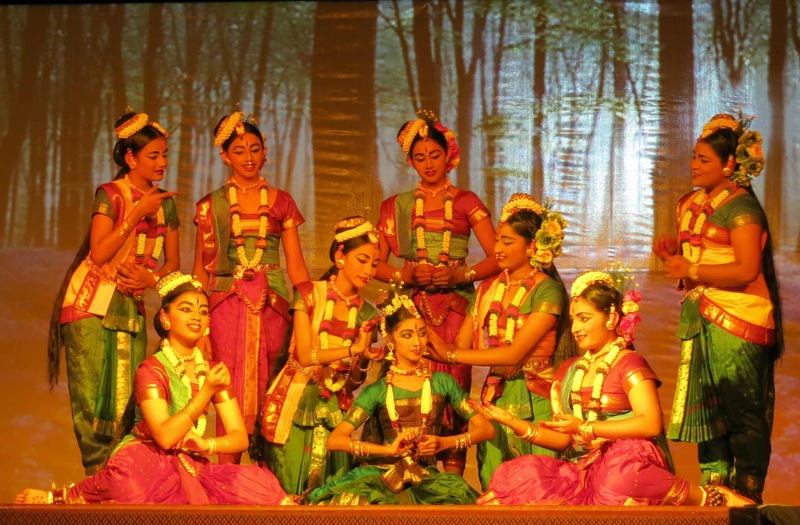 The Suvarna Fine Arts calendar of events culminates in much anticipated annual thematic presentations and since 1994 they have been presenting full length dance dramas. “Ajith is not merely a dance teacher but also a nurturer who gives his students a holistic education in all aspects of dance, ranging from dancing to teaching, to choreography and also aspects of staging a production,” said Meena Kumaree, the narrator of the drama. “This year, he debuted two of his senior dancers, Sujatha Vijay and Ananthemalar Durairaj, as assistant nattuvanar or dance cymbalists. Some senior students were also involved in wardrobe management, set and lighting design and execution,” she added. 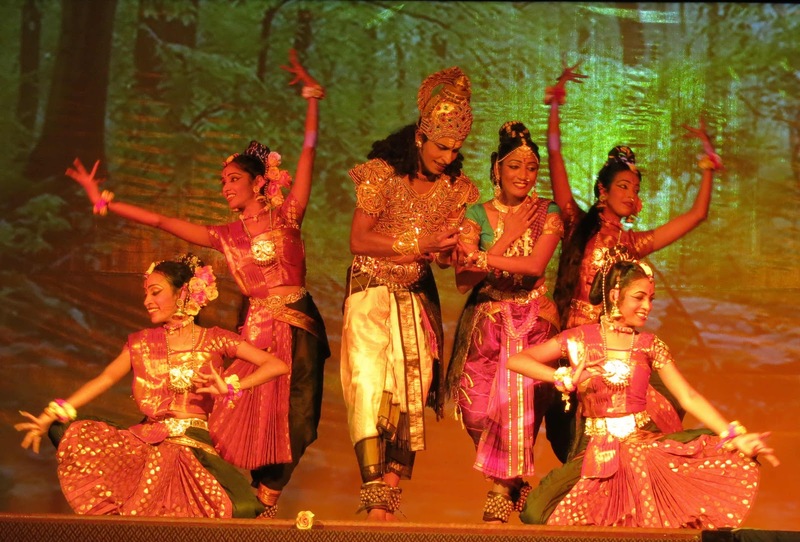 In an adaptation of Kalidasa’s legend of Shakuntala, the Ring of Remembrance, from the epic Mahabharata, Suvarna dancers retold the love story of beautiful Shakuntala and King Dushyanta with Ajith’s exciting choreography and artistic direction. For two and a half hours, they danced to live music played on traditional Indian musical instruments like the mridangam, tabla and the flute while the skillful violinist seemed to make it “speak” to illustrate poignant moments. Bhavani Logeswaran presented exquisite vocals with lyrics by V. Balakrishnan while Ajith provided the screenplay and voice-over and Meena Kumaree narrated in English. 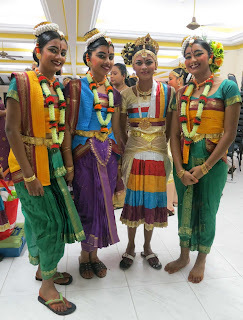 In this drama, 4 students were given the opportunity to showcase their skills by playing the role of Shakuntala at various stages of her life. Shakuntala as a child was played by Laavanyaa Murali while Haridivya Muralidharan was Shakuntala as a maiden. In the second part of the drama, Shaama Priya Kalaiselvan played Shakuntala as she was leaving the palace and Logeswary Durairaj was Shakuntala in the final few scenes. Similarly, the role of King Dushyanta was played by two students – Vijay Chandran and Vijayan Veereyan. Parents and fans of Indian classical dance in the audience recognized the hallmarks of Ajith’s touches in the drama because the performance reflected his extraordinary talent, deep spirituality, breathtaking creativity and absolute sensitivity. He is not only involved in artistic direction and choreography but also in every aspect of the production including designing the interesting costumes and choosing beautiful fabrics from India. “Ajith is a refined and disciplined dance teacher,” said Akkamarie Seenivasan Naidu, the mother of Manish Seenivasan Naidu, 17, a student with Suvarna Fine Arts since she was 8 years old. She said her daughter always enjoys the experience from their annual workshop and in this year’s workshop, students were given a concept and challenged to present a drama in a friendly competition. “He is doing a fine job at nurturing the next generation of students to be performing artistes,” she added. I was probably just five years old when I first heard Frankie Valli’s falsetto voice belting out, “Sherry, Sherry baby, Sherry…” from Aunty Polly’s tinny-sounding transistor radio. The upbeat rhythm, tight harmonies and unique sound of this group of singers, simply stuck in my memory. My aunts and uncles had their own transistor radios for music, just as grandfather (Ah Kong) kept one close to his ear to listen to the news. Back in the days when televisions were still an expensive luxury, we listened to portable radios usually tuned into the channel for Top of the Pops. The Jersey Boys performing "Walk Like A Man"
Around 1962, I also heard “Big Girls Don’t Cry,” a song I could personally relate to in my little girl context as I was still quite oblivious of boy-girl relationships. 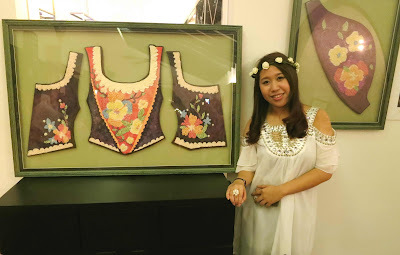 Growing up among two older sisters and bully-boy cousins in Ah Kong’s house, I was encouraged by the phrase – big girls don’t cry – especially through rough patches in my childhood. Even at a young age, songs such as this were like a balm that healed my little wounds! While I knew these songs, I did not know about the artistes – Frankie Valli or the Four Seasons – until 1978 when I heard the soundtrack from the first Grease movie. The song, written by Barry Gibb of the Bee Gees [who gained popularity in 1977 for the Saturday Night Fever movie soundtrack], was sung by Frankie Valli. When Grease came out, songs from this movie hit the charts and that was when I first got acquainted with Frankie Valli. Music from the radio – tuned into Singapore channels – is very much part of my life and I always have music on while I study and work. As a teenager, while I was falling in and out of love and studying for my A-Level exams, one of my favourite songs playing on the airwaves was Frankie Valli’s “Can’t Take My Eyes Off You” and “My Eyes Adored You.” I remember how my friends and I would sing along with passion as we know almost all the lyrics by heart and yes – I passed my exams! 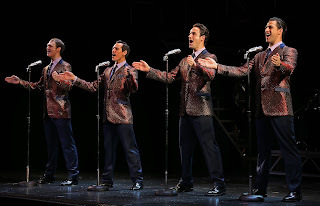 Frankie Valli and the Four Seasons are names that may not be instantly recognisable but for generations, since the early 1960s till today, their unique sounds remain fondly familiar. Here, the Four Seasons is not a classical piece of music by Vivaldi but the group name of four blue-collar young Italian-American men who became one of the greatest successes in pop music history. 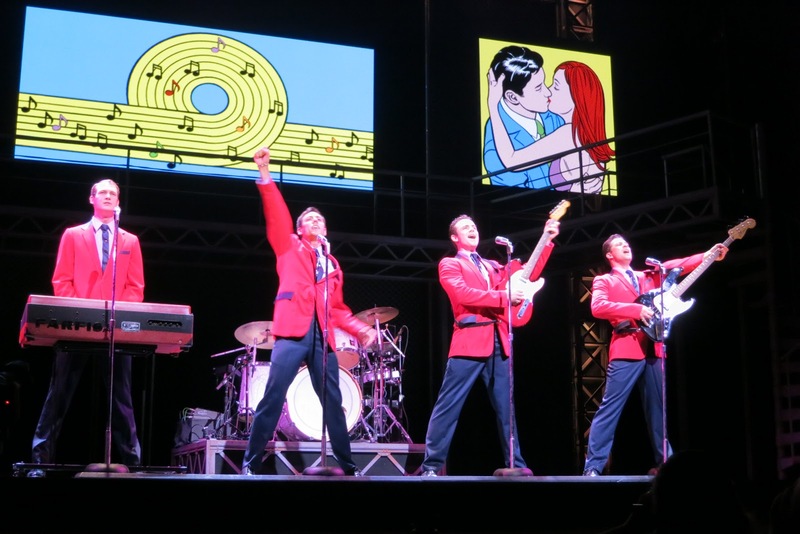 Their life story and music was made into a smash hit musical, Jersey Boys that went on to win four Tony Awards, including Best Musical and an international phenomenon that took these golden greats all the way to the Rock and Roll Hall of Fame! While listening to Singapore radio I heard the advertisements for Jersey Boys and was thinking about the show as I’m a big fan of musical theatre. I enjoy going for shows in Singapore especially when they are worldwide hits that are brought almost to our doorstep – in our neighbouring country. I know there’s nothing like watching a “live” performance but with work and family commitments, I did not give it much thought. I was at an event, in the middle of interviewing someone when my phone rang but I ignored it to focus on what I was doing. I always think that if it was important enough, the caller will ring again – and he did. 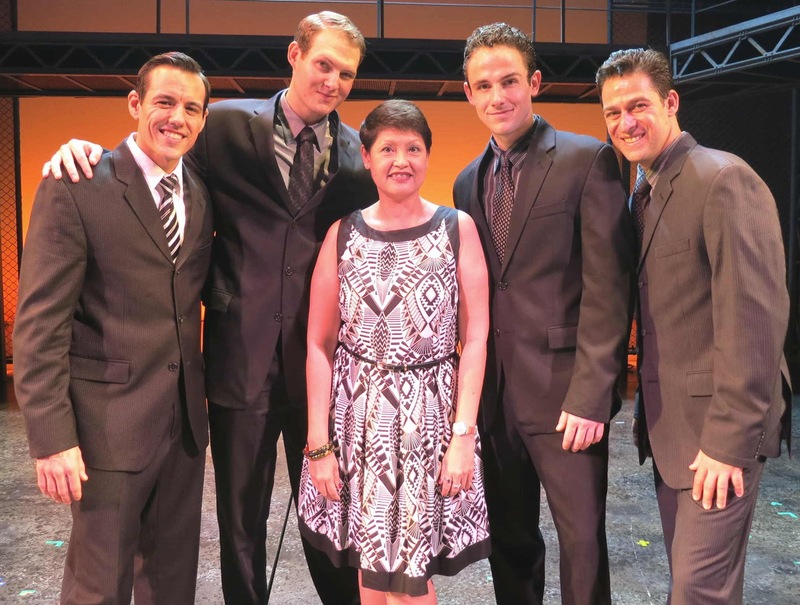 It was like a dream come true because the call was to invite me for a MasterCard Priceless experience with the Jersey Boys in Singapore! “It’s just too good to be true,” I kept telling myself but it is for real! 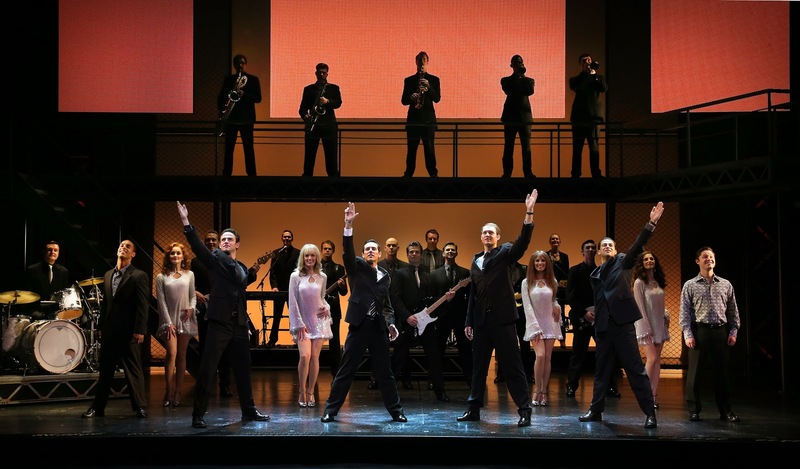 In a matter of days, I rescheduled my appointments and made myself available to meet the cast of Jersey Boys and be among the guests at the Gala Night when the Jersey Boys made its debut in Singapore on Nov 20. It is such a privilege that I must be mad to miss this Priceless experience! When I met the Jersey Boys, Grant Almirall [Frankie Valli], Kenneth Meyer [Bob Gaudio], Daniel Buys [Tommy de Vito] and Emmanuel Castis [Nick Massi], I told them that I’m from Johor Baru – a city in neighbouring Malaysia that is fondly known by its abbreviation “JB” – the same short-form, JB for the Jersey Boys! These four young men are part of the company that began rehearsing in Johannesburg and finalized their onstage preparations in Singapore in time to open for a 14-week season before returning to South Africa to premier in April 2013. 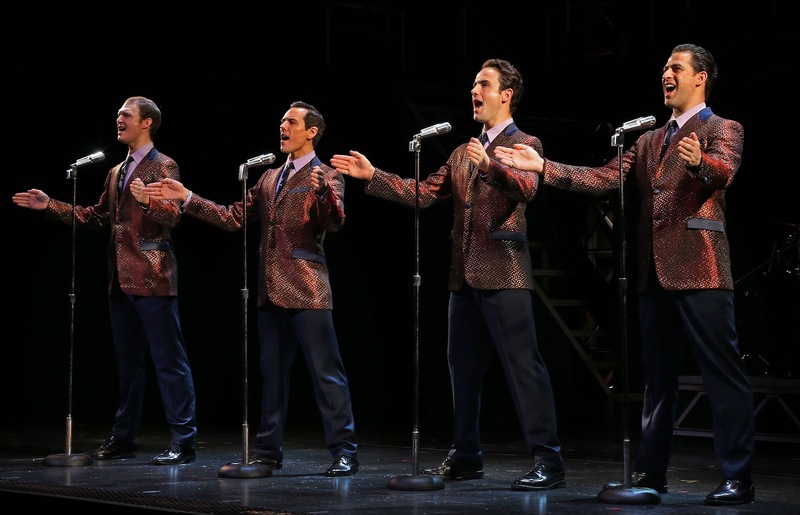 Frankie Valli and the Four Seasons have myriads of fans from across the Causeway and it is my privilege to show MasterCard holders that they can avail themselves of the opportunity to enjoy special experiences like the Jersey Boys in the MasterCard Priceless Singapore programme. On the Gala Night, I joined a throng of special guests for the premier performance of Jersey Boys as they shared their story in four parts, each representing a season of their career. The narration by each member of the Four Seasons illustrated their story in Spring, Summer, Autumn and Winter, charting their rise to success, the zenith of their success, the toll of their success and finally to sorrow and solitude. As each recognisable song was sung with clever choreography, I learnt about the stories behind their songs. I thoroughly enjoyed their performance, grooving to familiar songs, “Sherry,” “Big Girls Don’t Cry,” and “Walk Like a Man,” – the band’s third straight No. 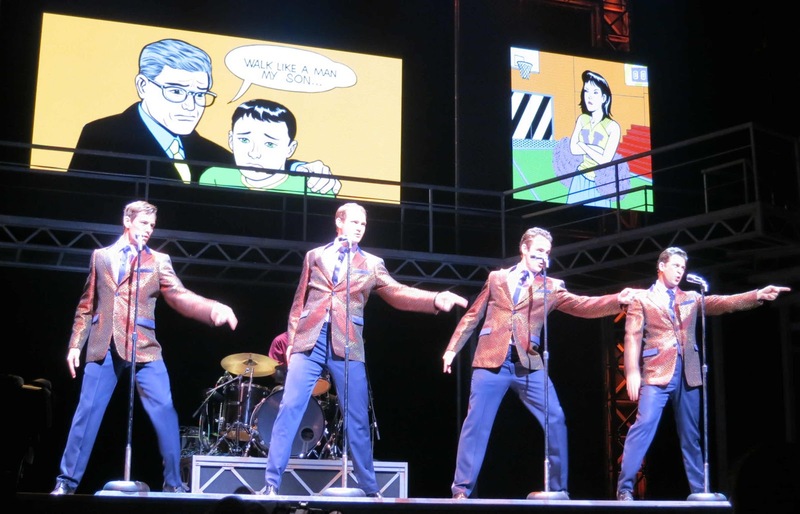 1 hit, and there were a few poignant moments when Frankie Valli sang solo, “My Eyes Adored You” and “Can’t Take My Eyes Off You” – and I shamelessly sang along! 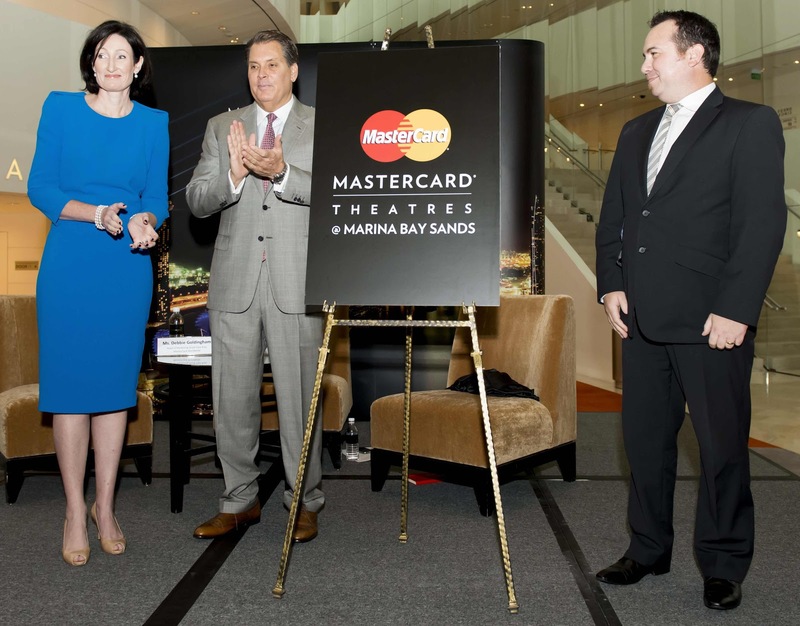 On Nov 19, Marina Bay Sands, MasterCard and BASE Entertainment Asia announced a 5-year partnership that brought the Marina Bay Sands Theatres within the MasterCard Priceless Cities programme. 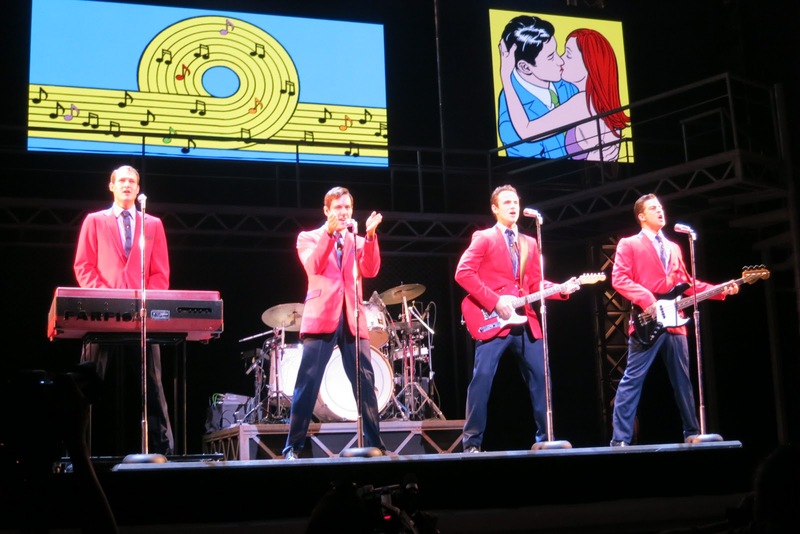 Jersey Boys is the first show to premier at the newly renamed MasterCard Theatres at Marina Bay Sands. Starting November 2012, MasterCard cardholders can have access to a range of exciting offers, including opening night shows, seat upgrades and discounted ticket prices for the best shows and productions showcased at Marina Bay Sands. “We are proud to join MasterCard and BASE Entertainment Asia in such an important global partnership. Working together, we will build the Marina Bay Sands legacy of delivering Priceless entertainment experiences to Singapore and South East Asia,” said Mark Juliano, Senior Vice President of Marketing at Marina Bay Sands Singapore. 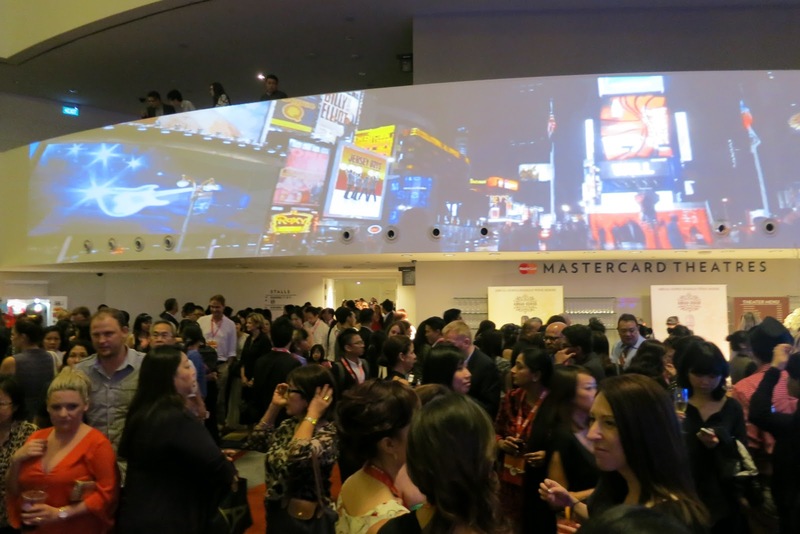 “MasterCard Theatres at Marina Bay Sands is yet another exciting collaboration for us, building on our already considerable global portfolio of sponsorship assets,” said Debbie Goldingham, Head of Marketing South East Asia, MasterCard Worldwide. “Through partnering with BASE Entertainment, we are able to provide our cardholders around the world with even greater access to world-class entertainment acts,” she added. 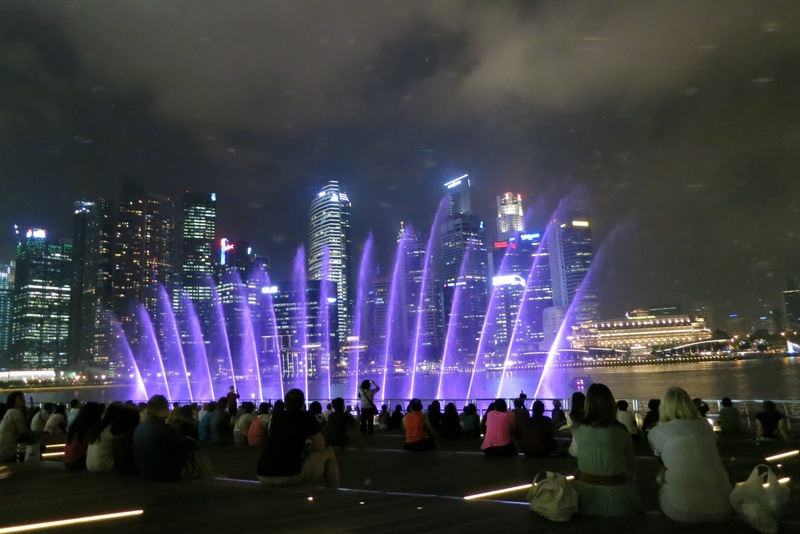 Singapore recently joined the ranks of other iconic Priceless Cities worldwide such as London, New York, Beijing and Sydney. 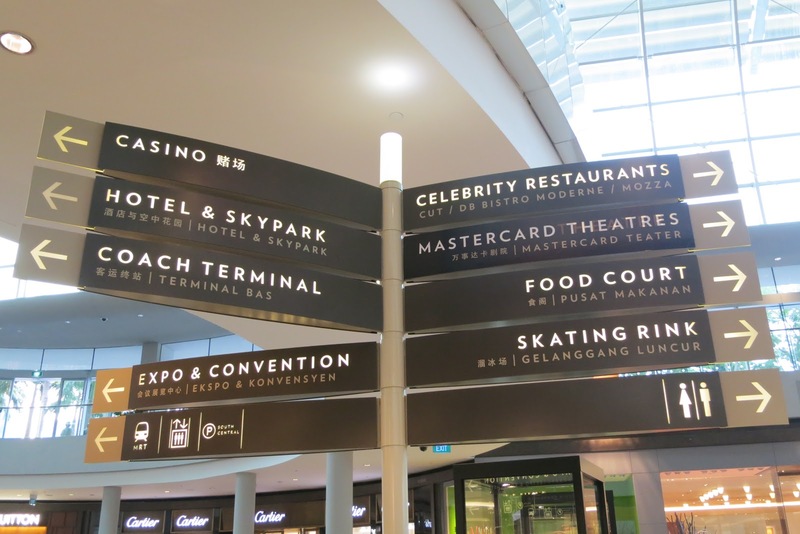 “We are looking forward to collaborating with MasterCard to offer unique and Priceless opportunities for their customers and continuing to establish the MasterCard Theatres at Marina Bay Sands as the pinnacle of live entertainment in the region,” said Milan Rokic, Managing Director of BASE Entertainment Asia. Check out more exclusive experiences available to MasterCard cardholders at www.pricelesssingapore.com and register to enjoy special admission, behind-the-scene access and exclusive privileges for dining, entertainment, shopping, travel and spectacular events in the Priceless Singapore programme. 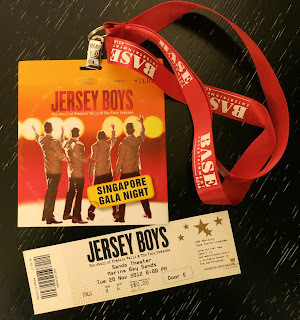 My MasterCard Priceless experience with the Jersey Boys at MasterCard Theatres at Marina Bay Sands was hosted by MasterCard Worldwide and Marina Bay Sands Singapore. 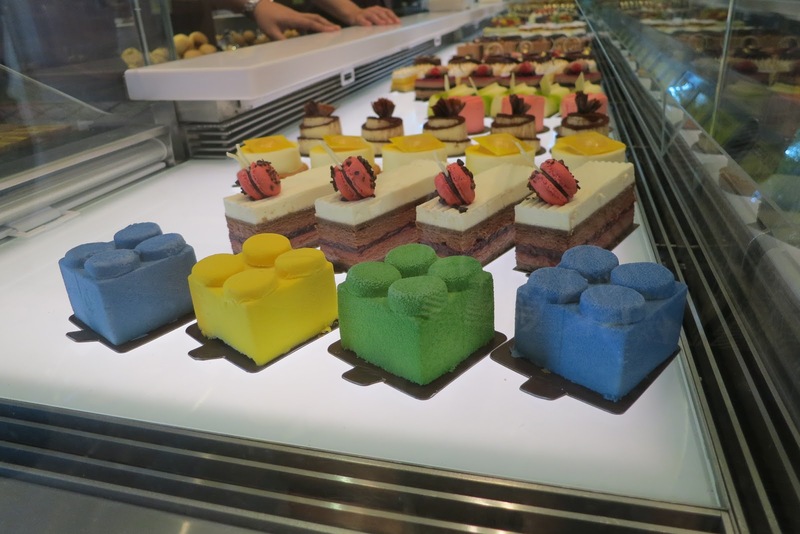 A visit to Legoland Malaysia in Johor Baru during the year-end holidays can be complemented with a Lego experience at The Art of the Brick exhibition now on in the ArtScience Museum, Marina Bay Sands Singapore till April 14, 2013. 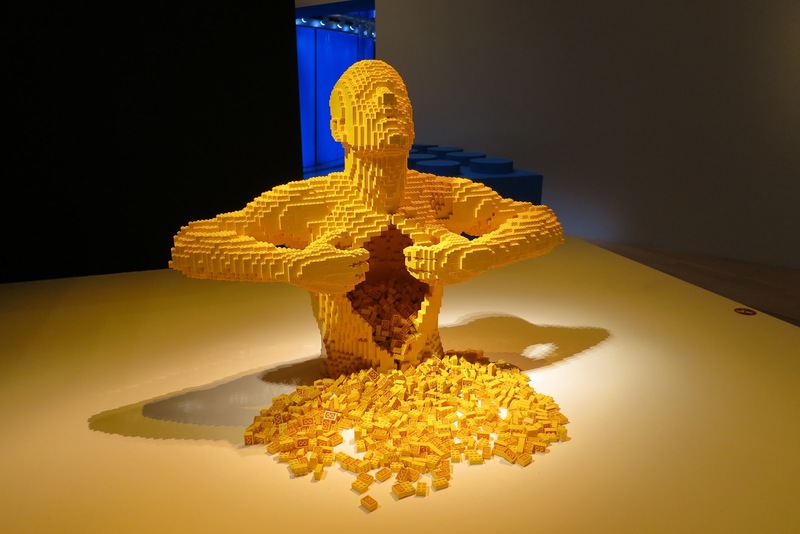 New York-based artist Nathan Sawaya, 39, received his first Lego set as a Christmas gift from his grandparents when he was aged 5. As an attorney, he worked long hours and could only indulge in his passion for Lego bricks after work. Inspired by how well his sculptures created with toy-building Lego bricks were received, Sawaya realised that he could make a living doing what he loves best. 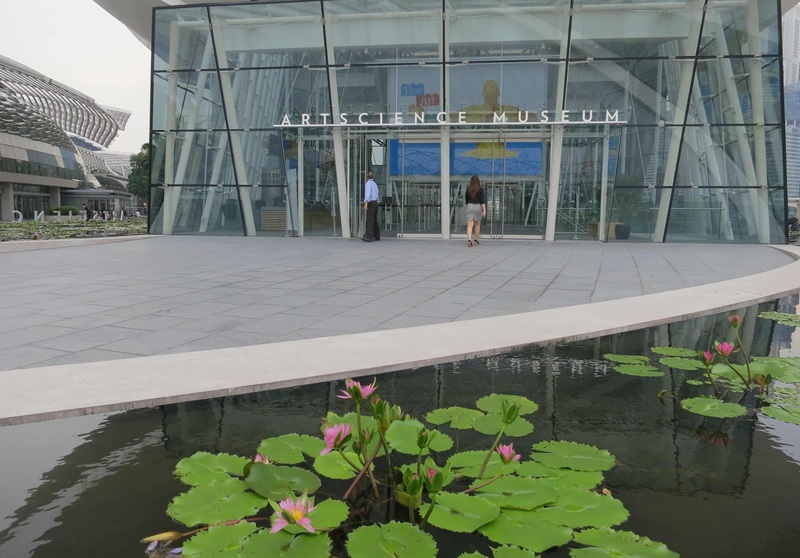 When his exhibition opened in Singapore on Nov 17, Sawaya unveiled a specially commissioned sculpture of the exhibition venue, the iconic ArtScience Museum in its lotus-inspired design. 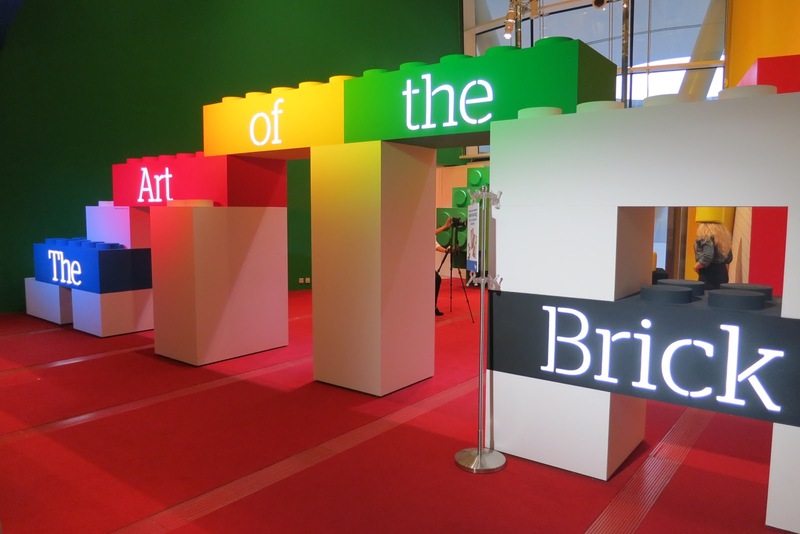 The Art of the Brick exhibition features the largest collection of 52 large-scale Lego sculptures ever displayed. Among other thought-provoking sculptures, you can look forward to see the biggest sculpture he has made using 80,020 Lego bricks – a 6-meter long Tyrannosaurus Rex skeleton. “There is no idea that cannot be expressed with Lego. I still use those same rectangular plastic bricks that I had as a child, but now I try and use them in a way that hasn’t been seen before,” read a quotation from Sawaya displayed in the exhibition. The exhibition takes visitors on a journey through several galleries like The Artist’s Studio, The Portrait Gallery, The Drawing Board and The Emotion Box. There are also interactive sections like the one in the Artist’s Studio where visitors are challenged to build similar 3-dimensional sculptures with the Lego bricks provided. If the Sawaya creation of Rain looks simple, just try your hand to make one of your own! 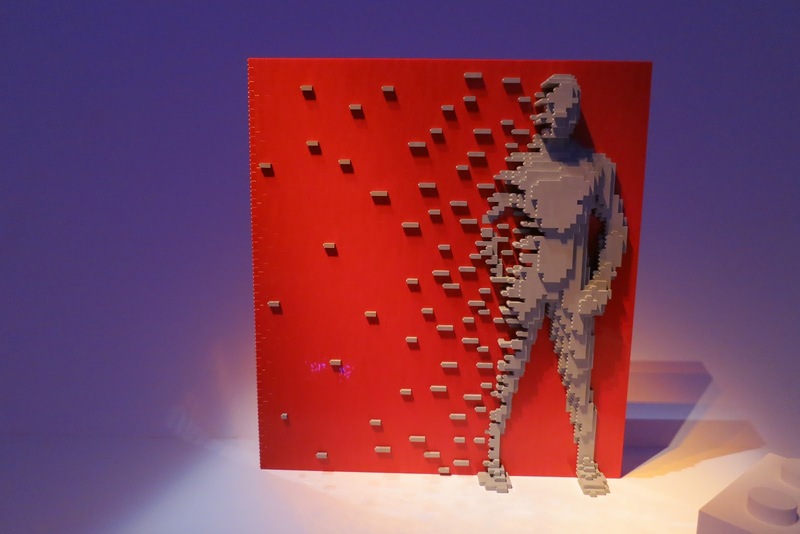 In the Portrait Gallery, you will recognise some famous personalities that Sawaya created by transforming 3-dimensional Lego bricks into 2-dimensional portraits. 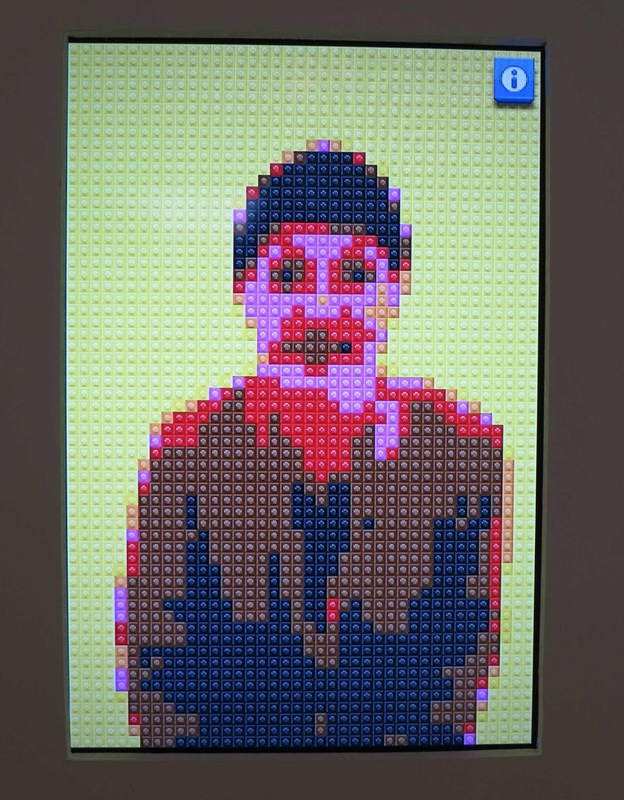 If you are keen to know how you will look in a Lego portrait, just step behind the camera set up in the gallery for an instant shot. You will be amazed that when you look beyond the bricks, you can easily recognise the person in the photo! My portrait created in Lego bricks! You cannot miss the full-scale sculpture entitled, Blue Guy, made with 21,054 pieces of Lego bricks. 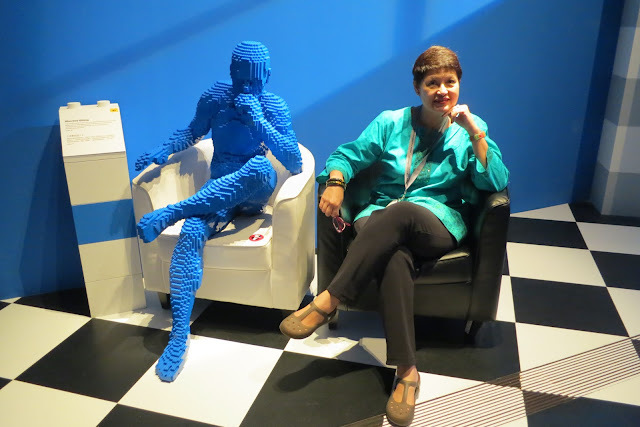 A chair placed next to this cool guy makes it irresistible for visitors to sit down and mimic his pose. After your experience of the artist’s uniquely playful imagination in The Art of the Brick, don’t be surprised if you are inspired to explore your own creativity with familiar Lego bricks. That's me with the Blue Guy!